Groundhog Day is a quasi-official national holiday celebrated on February 2nd each year. It is also the name of a classic 1993 movie featuring Bill Murray as Phil, who must live the same day over and over until he learns a lesson or two about life. Seems like voters might want to channel Phil for a while to consider why voting for Democrat policies and government in big cities is imposing the same day over and over on their poor, suffering residents. A year and a half ago, I coined the phrase “A Super-Massive Blue Hole” which referred to the pit into which major American cities pitch themselves by voting for failing policies and politicians that inflict misery and failure on residents over and over. Detroit was my example. Anderson Cooper and Rachel Maddow snarked at the avant-garde style of the video but had no comment on its point, that electing liberal Democrats into public office in big cities creates cycles of poverty. And doing so has the same result, on steroids, at the national level. Democrat mayors have governed Detroit since 1962, and a generation of kids and families has grown up in the entitlement society, compounded by a union mentality, which both crush individual initiative, personal responsibility and aspirations for a better life based on hard work and the reward that follows. •	A January 2013 report shows that sixty percent of children in Detroit live in poverty, which represents a 64.7 percent increase in child poverty in the city since 1999. •	Detroit’s murder rate is appalling. Detroit suffered with 411 homicides in 2012, as compared with 298 in Los Angeles, and 133 in Dallas (in 2011). • Two months ago Detroit mayor David Bing told CNN that the hardest thing he deals with every day is citizens thinking he can solve all of their problems. He describes long-term city employees as feeling entitled. This is a mentality drilled into citizens and government employees by the American Left, and it’s a mentality that hurts them. •	A December 2012 report says Detroit City Councilwoman JoAnn Watson openly said that Detroit voted for Obama, and he needs to bail them out—a feeble surrender to government as savior and as a bottomless source of money. Reality check needed. •	Detroit is the most dangerous city in America for gays. •	Detroit is now laying groundwork for managed bankruptcy. A few reasons? o	Intact families and productive, working, tax-paying citizens are moving out. o	In 1950, according the U.S. Census Bureau, Detroit had 1,849,568 people and by 2011, that number had dropped to 706,585. That’s over 1.14 million people leaving in 61 years. By contrast, Dallas, Texas had a population of 434,462 in 1950, and now boasts 1,223,229, an influx of over 788,000 in that same time period. o There were 12,103 babies born in Detroit in the 12 months prior to the 2011 Census Bureau survey, and 9,124 of them (75.4 percent) were born to unmarried women. o	Of the 264,209 households in Detroit, 91,204 of them, which is over 34%, get food stamps. o	The percentage of 8th graders who are grade level proficient in reading and math is in the single digits. One article full of more detail about Detroit’s plight is here. Detroit is a Mini-Me of the United States if we continue down the current Democrat entitlement spending, dependency creation, union and government-employee empowering, fiscally suicidal spending path. The notion that these failed policies constitute compassion for the poor is absurd: Detroit/Democrat policies, however well intentioned at the outset, are dismal and painful failures. They inflict poverty. The people deserve better. 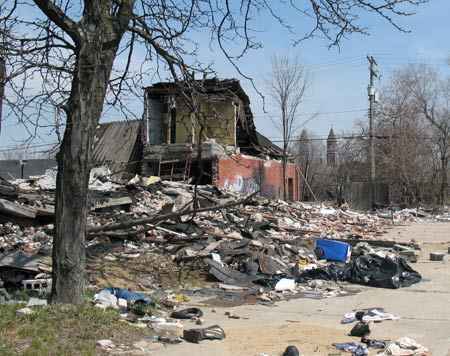 Detroit is Exhibit “A” about what’s wrong with today’s Democrat Party’s policies. It is not just the irrational and irresponsible spending and dependency-creation, it is the mocking dismissal of the basic American notions of liberty, self-reliance, personal responsibility, hard work and pride in earned achievement. It does not have to be this way. We need to get past this Groundhog episode of living the same miserable day over and over, and learn the lessons of rejecting government as the savior and provider, and rejecting leaders who place their faith in government programs as the solution to every problem. We must choose leaders who have faith in the goodness, hard work and industrious spirit of the people. To paraphrase a famous slogan, “it’s the Democrats’ policies, stupid”! Democrat policies promise the moon for free, and leave the good and great people of America worse than before they got started “helping,” a point I make in dozens of ways in my book, “Ladies, Can We Talk? America Needs Our Vote!” States with Democrat leadership have worse unemployment problems than states with Republican leadership. America’s cities with the worst poverty have one undeniable thread in common -- long term Democrat leadership. I love the optimism expressed in Detroit’s city motto “We Hope For Better Things; It Shall Rise From the Ashes.” And trite as it sounds, some of my best friends are from Detroit, and they love the Tigers, Pistons, Lions and Red Wings. But they live in Texas now. I wish for Detroit residents, as for every American, the American dream of opportunity, achievement, liberty and abundance. Detroit Mayor David Bing is trying, but he is dealing with a city filled with residents whose hopes and dreams and vision of hard work to achieve success have been battered into submission at the altar of “big government will take care of you” Democrat theology/ideology. Phil in the Groundhog Day movie figures things out, and we can too.